My time at Bemis was centred on exploring, experimenting and learning. I had no intention of taking any work home with me. I worked with a variety of materials and approaches. One of the core pieces was this piece of furniture that went through three months of transformations being broken up and spreading out and eventually being reconstructed and filled with all the additional materials that had formed part of its various transitions. This and other experiments will be forming the starting points for new works in the near future…..
Action realized 12th May 2015, Subirats, Alt Penedes for el Congreso de Arte y Paisaje organised by Miguel Vidal and held at Vinseum, Villafranca del Penedes. ‘Apetito’ is the first of a number of action/interventions in the landscape….placed here in the Alt Penedes . ‘Apetito’ is a collection of concepts. A pile of earthen spoons on the edge of a field, a line of red cord indicating the positions to be sown in a freshly ploughed field and on the land Yendell labours. Using a mattock to scoop out the earth, she plants the spoons one by one, each is situated swiftly and carefully in position, sentinel like the spoons hold their position. A final sifting of earth and the red cord rewound; the work is completed. As night falls, Yendell places a spoon on her shoulder and looking forwards walks out of the screen to some other place. ‘Appetito’: women’s complex and subtle relationship with food, its production, its preparation and consumption from distant time ‘til now made visible in all its layers of subtlety. is also in Production & research for documentaries. ‘Homeland’ Barcelona, is curated by Safia Art Contemporani, Angel Garcia and Natalia Foguet,in collaboration with Loop-Festival Barcelona and Damer House Gallery. The video is available to see on vimeo, contact me for the password. Varios cucharas recubiertos de tierra sobre un suelo de platos rotos. Estos dos elementos de la instalación transitan entre sus registros de asociación oscilando entre sus realidades varios y entran un universo poético de conexiones intencionales y involuntarios. After a tremendous month of exciting and varied activity Arte Jaén, Contemporary Art Fair has drawn to a close. Another version of Viaje Telúrico has been created in this lovely exhibition space in the hermitage of Nuestra Señora de Lomos de Orios de Villoslada de Cameros and will last til mid June. The hermitage is situated inside the national park la Sierra de Cebollera. Inaugura este sábado, 3 de mayo, a las 18,30 horas, la exposición ‘Viaje Telúrico PR’ en la ermita de Nuestra Señora de Lomos de Orios de Villoslada de Cameros hasta 13 Junio. El vínculo con la tierra inspira la obra de esta artista, donde lo cotidiano toma nuevas dimensiones, presentando una insólita visión cargada de belleza. Varias piezas de esta instalación pertenecen a la obra ganadora del FEM ART 2012, en el marco del festivas ‘Miradas de Mujer’. Lesley Yendell, de origen inglés, lleva más de 15 años afincada en nuestro país, y participó en la creación del Parque de Esculturas ‘Tierras Altas Lomas de Oro’ promovido por el artista y santero de la Ermita de Lomos de Orio, Roberto Pajares ‘Pájaro’, en el Parque Natural de Sierra Cebollera. ‘Viaje Telúric (PR)’ was made for the group exhibition ‘Summa Contemporanea’ an exhibition that formed part of the National Festival, ‘Mirada de Mujer’, curated by Marta Prieto the piece was shown in the Foundation Maria Forcada, Tudela. The spoons form a circle resting on a sea of broken bowls. These spoons covered in earth return us to the earth, the land and the field, the place of germination, cultivation and harvest. White bowls – broken, fragmented, dissolution there is no more holding of portion or share, they are undone. 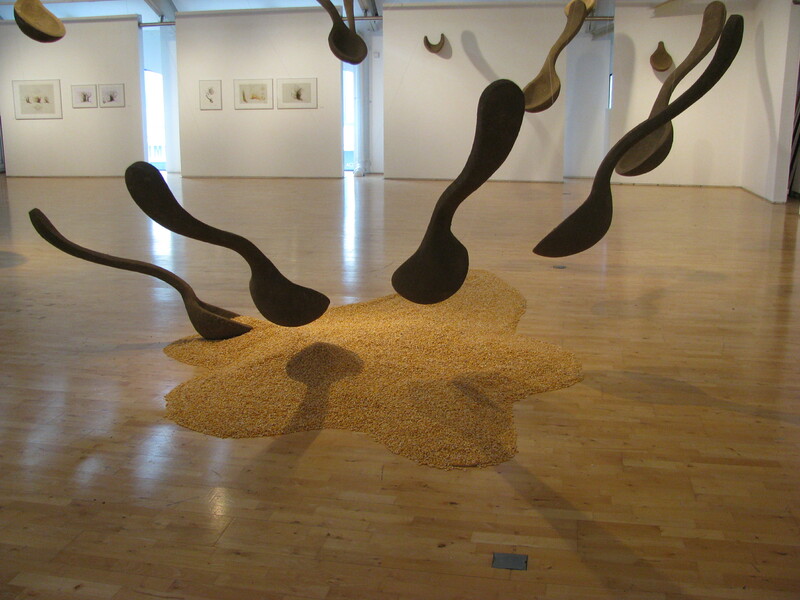 The spoons and bowls together move through their registers of association and enter a poetic universe of their own. Garden project for Wesserling Textile Museum. An iron made of branches on a tee shirt shaped flower bed planted with flowers. La Madre del Agua Caliente. La Madre del Agua Caliente, the monumental representation of an electric kettle, (how english!) is a precise assemblage of light branches. The material, the technique and the fastidious realization reminescent of the labour of men in the vineyards make that the size and nature of the object represents the equivilant weight of household tasks. Apart from a discourse on identity, ordinary life, and traditional cultures, ‘La Madre del Agua Caliente’ results in an unlinking of scale and context, apparently a burlesque monument and, inside the Meusien countryside, one understands from an ecological nuance the heritage of Pop Art born in England.